Participants on this pioneering delegation speak about what they learnt in Bosnia and what they will do with that knowledge when they return to Manchester. A pioneering scheme was piloted from Manchester in September 2016. 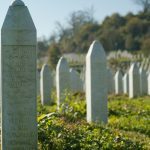 Senior figures, including members of Greater Manchester Police, academics, politicians and business people were paired up with the young delegates who they travelled with to Srebrenica. They are now mentoring them to help in completing their pledges to teach more people the lessons from the genocide to help tackle hate crime in the UK. In this video they speak about their experiences in Bosnia and their ambitions to make a difference on their return to the UK.